Back in 2009, I posted on a big cervical series discovered in Big Bend National Park. Then in 2013 I posted again about how I was going to the Perot Museum in Dallas to see that cervical series, which by then was fully prepped and on display but awaiting a full description. Ron Tykoski and Tony Fiorillo (2016) published that description a couple of years ago, and after almost five years it’s probably time I posted an update. I guarantee you, standing next to that thing and imagining it being inside the neck of a living animal is a breathtaking experience. So, this is an awesome specimen and you should go see it. As you can see from the photos, the vertebrae are right on the other side of the signage, with no glass between you and them, so you can see a lot. The rest of the exhibits are top notch as well. Definitely worth a visit if you find yourself within striking distance of Dallas. Tykoski, R.S. and Fiorillo, A.R. 2016. 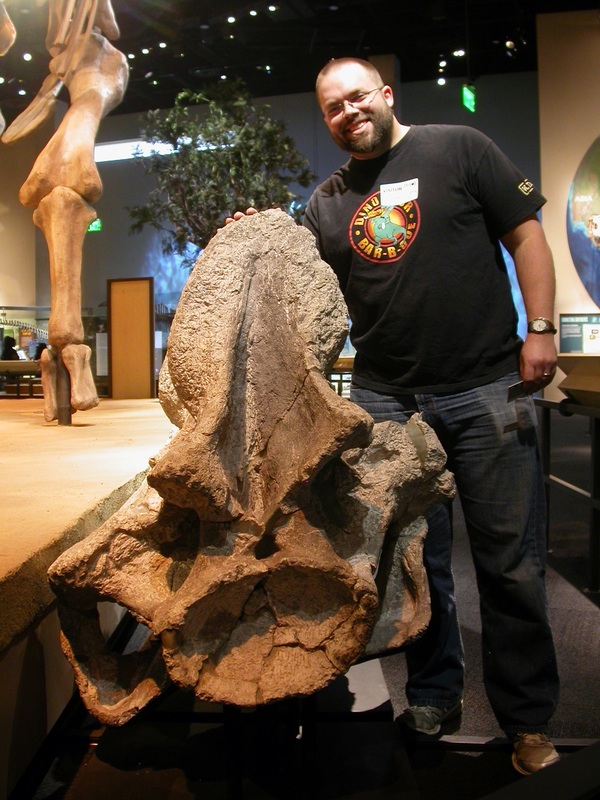 An articulated cervical series of Alamosaurus sanjuanensis Gilmore, 1922 (Dinosauria, Sauropoda) from Texas: new perspective on the relationships of North America’s last giant sauropod. Journal of Systematic Palaeontology 15(5):339-364. The striking thing about this cervical sequence is how relatively little morphological difference there is along the neck: the vertebrae seem to be slightly-differently-scaled models of each other, in comparison with for example the much greater variation along the neck of Diplodocus. That thought occurred to me based on your photos above, but in fact the published illustrations seem to bear it out. Yeah, totally. 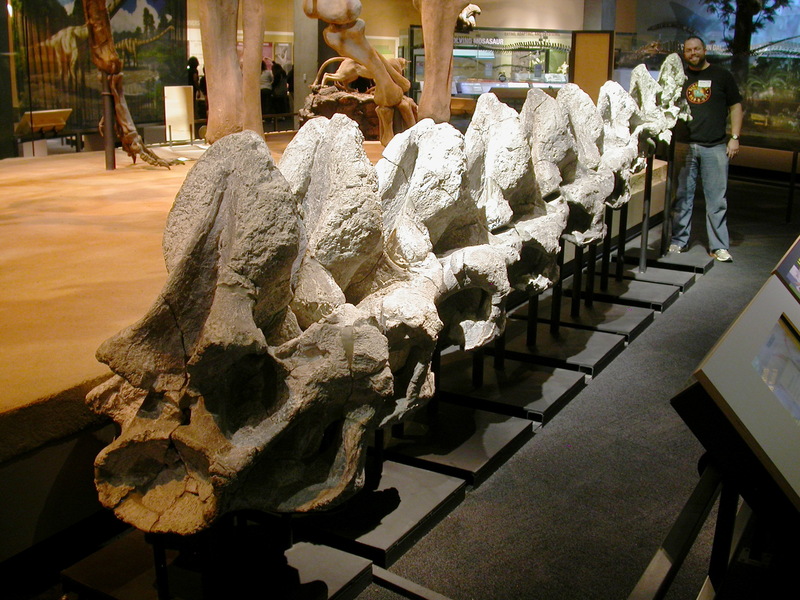 What’s really striking to me is that all of the vertebrae look like the posterior cervicals of something like Malawisaurus, like there has been a wave of posterior-cervical-ization sweeping up the column. I don’t know what the advantage would be there. 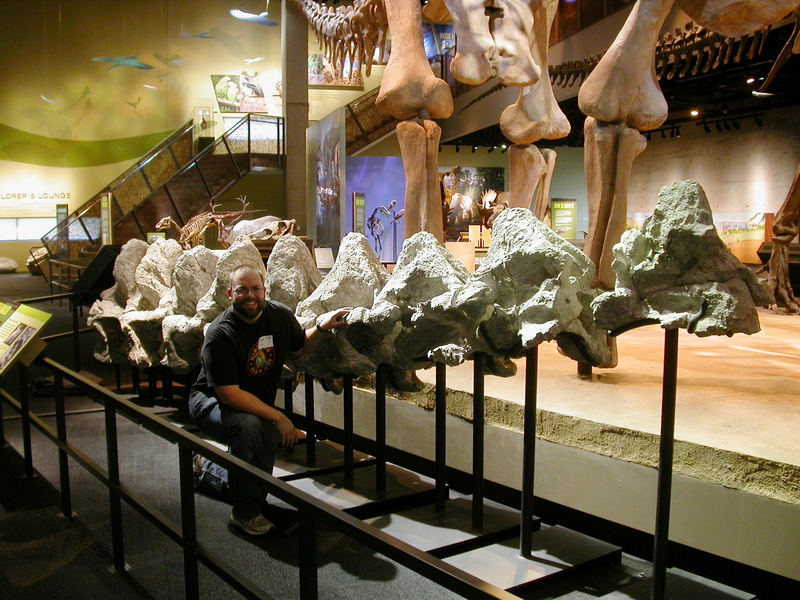 If you think about something like Plateosaurus or even Shunosaurus, the cervicals vary much less along the column than they do in most neosauropods. Diplodocus is a great example, maybe the best available, of pronounced morphological change along the cervical series. I get why that would be advantageous. It’s much less obvious why – presumably having passed through a Malawisaurus-like stage with differentiated cervicals – at least some derived titanosaurs seem to have less disparity along their cervical series. Possibly some complex muscle/tendon/air sac/bone interaction that we are not likely to figure out anytime soon. Hi, I just wanted to thank you for your work! And it’s great to have new vertebra pictures, please don’t stop posting them! I don’t know, how and when exactly it happened, but a couple of years ago I got hooked and am enjoying every one of them. My Perot membership recently expired; I really need to renew it. The Perot is quite excellent, and I love seeing the Alamosaurus every time. I like they have both the mount and the actual neck vertebrae displayed next to each other! I am a young paleoartist from Greece. I’m sorry to bother you but I needed some sauropod experts to answer me two questions I have about Alamosaurus. 1) Since Alamosaurus is a derived titanosaur, how possible is it that it had an unusual number of cervicals? This feature already appears on Rapetosaurus and Dongbeititan. Does this mean that it’s a general feature of derived titanosaurs (such as Saltasaurus, Isisaurus etc.)? Hi, Dimitris, great to hear from you. 1. Number of cervicals is a pretty labile character among sauropods. I don’t know offhand how complete our best Alamosaurus necks are, though this sequence of nine is pretty impressive. In the absence of a complete neck I’d say there’s decent leeway in the cervical count. The 14 in the reconstruction you reference here doesn’t seem unreasonable. 2. That reconstructed neck looks crazy tall, but you can see for yourself in the linked post that it’s accurate. Would have been wide, too. But as the DeviantArt comments note, the torso may be proportionally too small. The bit of that piece that bothers me is the very abrupt cervicodorsal transition. It seems like cervical number remained steady at 12-14 and increased a few times, like in mamenchisauridae and euhelopodidae. Considering Dongbeititan and Rapetosaurus I find it possible that the same trait also appeared in saltasaurids, possibly including Opisthocoelicaudia and Alamosaurus. 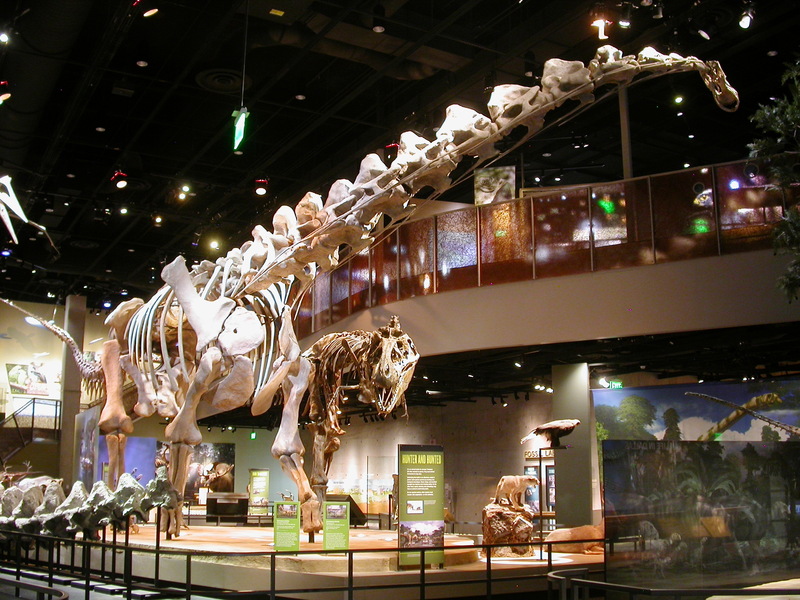 The same abrupt transition seems to exist on the Perot Museum version to a smaller degree. The cervical spines start too tall at the base of the neck. https://www.tandfonline.com/doi/pdf/10.1080/14772019.2016.1183150 Scott Hartman on the other hand made the transition rather smooth. He is more conservative with neck size.